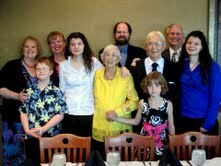 On Sunday, November 11, 2012, Väino and Leena Aare, members of the Estonian Society of Central Florida (Kesk Florida Eesti Selts), celebrated their 60th wedding anniversary with family and friends. This year is a special year for the couple: In addition to their 60th wedding anniversary, they are both celebrating their 90th birthdays. Undoubtedly they know the secrets to happiness and longevity. Our congratulations and best wishes to the happy couple! Celebrating Väino and Leena Aare’s 60th wedding anniversary, November 11, 2012, are family members: (left to right) daughter Linda and Linda and Paul’s son Markus; daughter-in-law Hilda and Hilda and Peeter’s daughter Erika; Leena; son Peeter; Väino; Linda and Paul’s daughter Merike; Linda’s husband Paul; and Hilda and Peeter’s daughter Christina.